If you’re one of the few people not watching “Empire” on Wednesday nights … well, you may still be in the sizable group that catches it on Thursday via the network’s streaming app, Fox Now. Lee Daniels‘ marriage of music and drama has been a ratings smash for the struggling broadcast channel, but it’s also been a godsend for its digital team, led by president David Wertheimer. “We had a great platform built, a great foundation, then along comes this amazing show ‘Empire’ and it becomes a huge hit,” he told TheWrap. Probably unsurprisingly, “Empire” is the biggest show Fox Now has ever had. But the way Wertheimer puts it is interesting: “Every Thursday is the biggest day we’ve ever had in Fox Now,” he said. For comparison, CBS and ABC’s respective apps have meager one-and-a-half-star user ratings apiece. So why is Fox’s catching on? Well, Wertheimer, a protege of Steve Jobs, brought many of Apple’s philosophies to his Fox gig. He focused on interface and the user experience, calling the result “useful but simple.” In addition to planned ease and beauty, Fox Now just works well, as emphasized by its App Store star count. Third, it has the biggest reach among its competitors. Ever since DirecTV adopted Fox Now this past December, more than 80 percent of the country’s U.S. pay-TV subscribers can now access all of Fox’s shows — the most in the industry. And those who want to sample Fox’s freshman shows don’t even need a television subscription to do so. The results? Viewership on Fox Now is up 75 percent year-over-year, and the app just crossed 20 million downloads across all platforms. Thanks mostly to “Empire,” February was Fox Now’s biggest month ever for mobile downloads, with nearly one million. (A recent integration of “American Idol” voting into the app also helped.) “Empire” alone has accounted for 21 percent of Fox Now viewing over the entire season. And that’s saying something, considering “Gotham” and “Family Guy” also perform particularly well on the platform, and “Empire” is a midseason show. Following that record (short) month, March is off to a nice start too. In addition to the continuing Terrence Howard-Taraji P. Henson drama, Will Forte‘s “The Last Man on Earth” is “crushing” — Wertheimer’s word, not ours — on the platform. The post-apocalyptic sitcom received more than two million streams on digital platforms (Fox Now plus Hulu) in the week following the premiere, Fox touted. 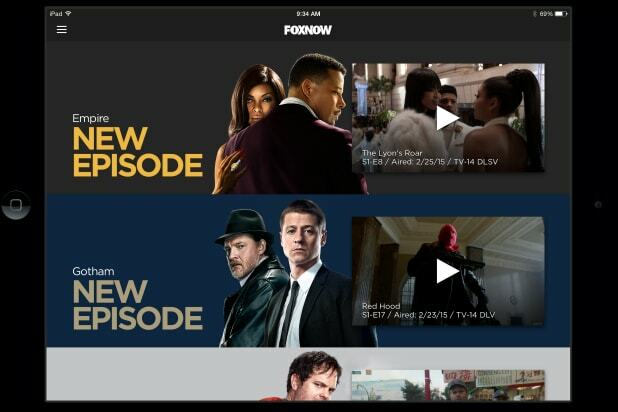 The success of the Fox Now app and the network’s early adoption of TV Everywhere could possibly pave the way for a subscription-based standalone over-the-top Fox service, much like CBS All Access. That Les Moonves-run network’s offering is part of a much larger industry trend — particularly among cable companies. Last week, at the Morgan Stanley Technology Media & Telecom Conference, 21st Century Fox COO Chase Carey didn’t unveil specific news of such a product, and promised that his network would not abandon traditional bundling, but he did say that they may become a “bigger part” of the OTT environment. For now, it’s the free service that Fox network is focusing on. In addition to Fox Now’s obvious primary purposes of customer service and ad sales (bringing eyeballs to shows and, thus, their commercials), it also provides the network with some bankable strengths. The industry has wised up on the benefits of catch-up viewership and binge-watching — having an entire season’s worth of episodes available eventually can aid a viewer back to your live TV. Translation: more ad sales. But the app specifically can also expose viewers to more Fox properties than, say, pulling up a show on-demand via a cable box. Fox can give app users additional content surrounding a show, and even help viewers engage in social media conversation directly — spreading the gospel to others. That said, Wertheimer swore to TheWrap that he doesn’t care how you watch his shows– just that you watch them. So, any readers who logged on to Fox Now Wednesday at 12:00 a.m. PT sharp to catch Cookie’s latest hissy fit or Lucius Lyon’s most recent violent act, you were not alone — not by a long shot. And you count, whether Nielsen tracked you or not.